A new card has been revealed by DDaHyoNi! If you are going first, then you play this card, you give up your first player advantage. The following turn after you play this card, your opponent has 1 mana crystal over you. You have 5 mana, they have 6. Is this good? Is this bad? I don't really know, but that is a fact. People complain about druid's insane early ramping ability and Blizz creates a tech to address it, but people say the card is bad. I respectfully disagree. "Set" suggests something different than "gain" (or "lose"). I believe "Set each each player to 5 Mana Crystals" means exactly what it says and has no hidden meanings about refreshing mana crystals. The interesting case is this: what happens when you play it on 10 full mana crystals? Do you have five empty or four full and one empty mana crystal? If you play it on turn 10, you'll have 4 full and one empty crystal. You use the crystals before any are destroyed... is a way of looking at it. They've clarified that it counts the mana you've spent. I.E. play at 10 have 4 mana and 1 empty. play at 6 have 5 empty etc. It doesn’t seem so bad. Just bad. A card that is pretty much unplayable unless in combination with a legendary doesn’t seem like the best option. And your opponent is still at 6 mana (having the mana edge) while you still have to draw your minions before you can start to benefit. I really like this card and it’s effect, though. Your opponent, a druid, ramped up to 10 while you have 4 or 5 has a huge mana edge on you already don't you think? You are bringing him back to 6 how bad can such a card, having a 5/5 body, be? Why is this anti combo ? If your playing aggro they wont be able to use combo. If you play control vs combo deck you just delay your death by 5 turns. delaying the combo deck by 5 turns is huge....you put the pressure very early on combo deck forcing him to use his defence/healing/stalling cards...just as if you are trying to beat him before he plays combo. Depending on combo deck you are playing against you then drop Mojomaster Zihi turn 6 and so on up to turn 10. Not sure yet about the text of the card but you should be able to copy it with Zola the Gorgon or use Baleful Banker. At a certain point combo deck will run out of defence/healing/stall cards (that's all they have in fact) and gg. 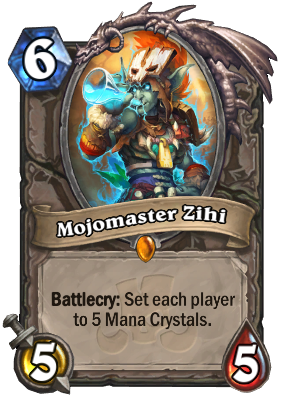 Mojomaster Zihi will also be a problem for control decks like Lich Jaina and Guldan. Well, screw your combo, I guess. dose this mean the maximum will be 5 mana or they will be 5 mana of maximum 10 mana ? after you play this card, your opponent will have 6/6 mana available on his turn. Aggro doesn't care about how much mana the other guy has, if you have this in your hand turn one instead of a 1drop you're going to see why it might not be the best fit. Most likely you'd see a tempo deck run this to basically take over after an opponent's full board clear; you play a 4 drop and this. Then you leave your opponent with only 5 mana to counter that play. 10 mana play with an empty board and only 5 (6?) mana left for the opponent to answer with sounds like tempo to me. Probably the best use of the card. This card is low tier for control unless it somehow helps you slow the game down for some last ditch defense effort, giving it a dual purpose along with countering 10 mana combos and a tempo empty board push. Who knows how that affects your own control game since you're screwing yourself too. This is the first card I've seen that really supports surrender to madness. It's still a later play, but surrender to madness in 9 followed by this and now you're on even during with the rest of your minions in your deck getting buffed. They dont need it against control, as kingsbane is a 90% lose matchup for control.